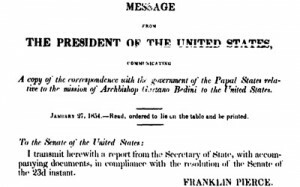 "Monsignor Bedini, Archbishop of Thebes, former Commissary Extraordinary of the Pontifical Government to the Legations, has left Rome as special Envoy of His Holiness to the United States. 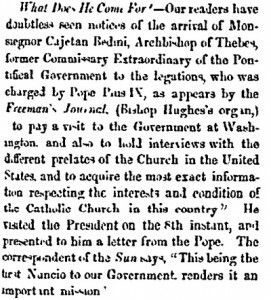 He is charged by the Holy Father to pay a visit to the government at Washington, and also to hold interviews with different Prelates of the Church in the United States, and to acquire the most exact information respecting the interests and condition of the Catholic Church in this country. After making as along a visit as may be of advantage in the United States, Monsignor Bedini will go to Brazil, where he is to reside as Apostolic Nuncio near that Government." The charge made, or rather repeated by the former priest and revolutionary, Alessandro Gavazzi, was that Bedini had had the Italian poet and patriot Ugo Bassi tortured and handed over to the occupying Austrian forces who executed him. Although the charge was without any foundation, Gavazzi, who had arrived in New York a few weeks ahead of Bedini, followed the prelate throughout his American tour in order to stir up anti-Bedini feelings, calling him the “Bloody Butcher of Bologna,” and thereby anti-Catholic sentiment especially among the Know-Nothings. And he succeeded. Nonetheless, in spite of the opposition of a few Senators and the gallery outbursts, the Resolution passed. Here, from the U.S. Congressional Serial Set, is President Pierce’s response to it. The fact that the State Department inconveniently lost the diplomatic correspondence from the Vatican Secretary of State regarding Bedini’s mission both complicated matters and, in one reading, allowed the Federal government to deny any culpability for failing to grant Bedini diplomatic protection. 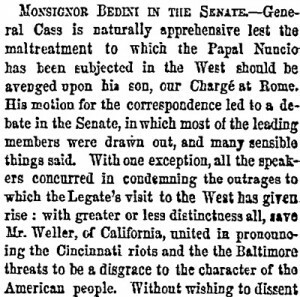 In apparently seeking to apologize for the United States, New York’s The Weekly Herald of January 28, 1854 made a distinction between the classes of people responsible for Bedini’s ill treatment; namely “ignorant boors” [largely German and Irish] and “philosophic revolutionaries” as opposed to upright native-born Americans. 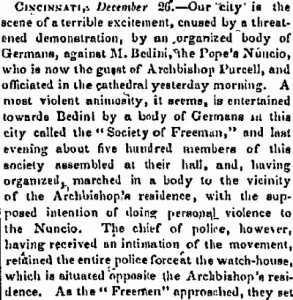 Almost precisely a month after Bedini’s secret departure from New York harbor, the Pope’s stone was stolen from the Washington National Monument site and destroyed by a small band of Know-Nothings, not necessarily German-Americans from Cincinnati but men of similar anti-Catholic and anti-papist persuasion. 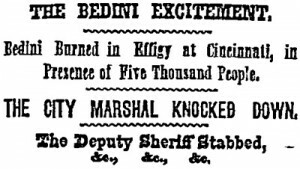 Of course, in the sad case of Bedini one can see, in addition to religious animosity and definite American confusion between Church and State in Europe, an admixture of real political animosity, ignorance, and fear—but that is no excuse. Sources: the primary monographic source for Bedini’s visit is the 1960 Gregorianum University dissertation The Visit of Archbishop Gaetano Bedini by James F. Connelley (Analecta Gregoriana, vol. 109, Series Facultatis Historiae Ecclesiasticae, sectio B, n. 20), which relies heavily on Vatican archives but does not cover all the newspaper sources now available electronically and digitally searchable. See also the article “Know-Nothings, Nationhood, and the Nuncio: Reassessing the Visit of Archbishop Bedini” by David J. Endres in U.S. Catholic Historian, vol. 21, 2003; and the 1856 work The Catholic Church in the United States by Henri de Courcy de Laroche-Héron, a correspondent for Univers and other French Catholic periodicals, who was a confidant of Bedini.